How bad does it have to be before a locomotive snowplow gets stuck? 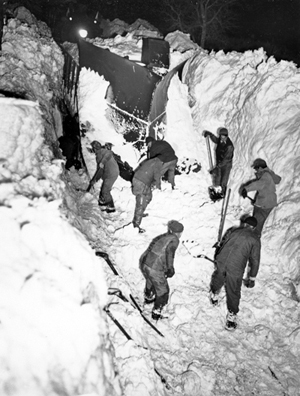 A crew near Chadron on the Chicago and North Western line resorted to hand shovels to dig out a snowplow during the winter of 1948-49. NSHS RG3139-27 (left). Maybe it will warm up by the time you read this. Or maybe there will be a foot of new snow. But if you think this winter has been rough, ask someone who remembers the winter of 1948-49. A series of storms between November and February paralyzed the northern Plains, including the northern third of Nebraska. It got so bad that the Air Force tried dropping hay bales from cargo planes to feed starving cattle. You can read all about it in Harl Dahlstrom’s award-winning article, “I’m Never Going to be Snowbound Again, the Winter of 1948-1949,” which filled a special issue of Nebraska History in Fall/Winter 2002. The link above is to a PDF of the entire article, one of many that we’re making available on our website (see the current list here.) But if you’d rather read it on paper, our Landmark Stores also have the blizzard issue and many other past issues in stock. Nearly three weeks later, Westover’s face was still too painful to shave. There. Now don’t you feel better? Spring is coming.